BBC News explains the northern town riots of 2001, what happened and the reasons why they happened. What were the northern town riots? In the summer of 2001, a number of northern towns in England erupted in violent clashes predominantly sparked by racial tensions, mixed, to some extent, with orchestrated rivalries between criminal gangs. Oldham, Burnley and Bradford experienced violence which saw hundreds of young Asian men (Pakistani and Bangladeshi) take to the streets. In contrast, some other areas of the country with similarly high levels of ethnic diversity, such as Birmingham and Leicester, saw no trouble at all. So what happened in these towns? The riots in Oldham took place over three successive nights in May and resulted in 86 police officers being injured. The next area to see violence was Burnley, resulting in clashes between hundreds of white and Asian youths and widespread damage to property and businesses. 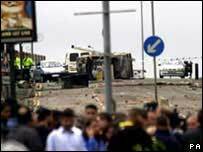 Finally, on 7 July 2001, the worst of the violence erupted in Bradford when 1,000 young men brought widespread destruction to the Manningham area. Some 120 police officers were injured in the violence that sent shockwaves through the country. The Oldham riots were said to be the direct result of racial tension between the area's Asian and white communities, the underlying factor being social division and poverty. The story in Burnley was slightly more complicated. The investigation suggested that rivalries between criminal gangs, one Asian and one white, were at the heart of a problem which grew beyond anyone's control. Finally, events in Bradford blew up when an Anti-Nazi League march led to an apparent stand-off with National Front supporters, precipitating clashes when the police tried to intervene. What was the government told about the violence? At the heart of the investigations into the violence was the hard-hitting national report into the events by Ted Cantle, the former head of Nottingham City Council and an expert in "community cohesion". He pulled no punches in a devastating critique of civic and central government policy. People were living "parallel" and "polarised" lives where people from different ethnic backgrounds simply did not mix, said Professor Cantle. Where one community had services designed for their needs in one area, such as employment training, schools and voluntary bodies, an exact but separate replica could be found working independently for other communities. "These lives often do not seem to touch at any point, let alone overlap and promote any meaningful interchanges," he warned. Among the 67 recommendations on housing, youth, regeneration, politics and education, the Cantle report called for an "open and honest" debate on the nature of multicultural Britain and what should be done to foster ties. It said the task would be huge and take years to achieve because there could be no quick fixes. The government's policy towards single-faith schools was called into question, with Prof Cantle saying no school should have more than 75% of one single ethnicity. Nationally, government needed to do more to foster a sense of the rights and responsibilities of citizenship. The recommendations called for better training in town halls on the realities of a diverse society, and how to serve all citizens equally. It even shone a light on political parties, calling for them to rethink their conduct. The key element picked up by the then Home Secretary David Blunkett was a better understanding of citizenship, now a key requirement for immigrants seeking to become British. Citizenship is also part of the school curriculum. But without a doubt the events of 2001 shocked government - and they came at a time when the UK was already beginning a debate on the revival of mass immigration and the difficult nature of shaping a modern, multicultural society. In May, Prof Cantle returned to some of his themes for a review of Oldham's progress. Divisions were at their most extreme in housing and schools, said his new report. But he added that while it could still take a generation to bring down barriers, Oldham had made a good start and needed to pass on what it had learnt to other cities. Burnley accepts that it was making mistakes five years ago - but believes it has started a healthy process of soul-searching to challenge prejudices. In some of the communities the wounds, however, remain raw. Many families in Bradford, who actively helped the police identify their sons' involvement in the rioting, were later appalled by what they said were excessive prison sentences. I travelled from Birmingham to Bradford to visit friends during the riots. I witnessed the grotesque nature of the BNP/National Front rallying and provoking the citizens of Bradford through synchronised chanting of racial abuse. After witnessing the stampede moments later I ran into the back of a stranger's van that was also caught up in the situation. We fled the area to safety. Did I mention I'm Asian and the guy who helped me was white? If we can help each other then why can't we all live in harmony? Nothing's changed, it may have got worse, BNP are getting stronger in Burnley. The poor white areas still do not get any government help. Duke Bar is a no go area after dark. So much for all the Government talk about helping Burnley. zzzzzzz Both sides do not mix. I grew up in Manchester and went to school and college in Oldham. Both school and college were mixed race and I found no problems with racial integration. That was between 1994-2001, and I made some very good friends who lived in the areas where trouble flared. It's very hard to believe it happened, any racial incident which was taken a hold of by the media was widely condemned by my classmates of all ethnic backgrounds. There was an elderly white gentleman beaten up by some Asian youths just outside Oldham town centre. That disgusted everyone I knew regardless of where they came from or what there skin colour was. Hopefully the area can return to what it once was when I knew it.